The modern tendency that many bands research old sonorities can be a trap for many (because it seems that some musicians don’t understand the difference of creating music and copying someone works), and to others can be a good choice. In the case of the Norwegian quintet BEFOULED, for what we can heard on “Refuse to Rot”, their first album, we have to take some care for a deeper analysis. Obviously, their musical work shows a deeper root in the Swedish Death Metal scene from the 90’s, especially in names as DISMEMBER and ENTOMBED in their age, when both bands were unleashing a distorted and brutal form of music. All will remind us a lot what we hear on “Left Hand Path” and “Like an Even Flowing Stream”. But it’s not a copy of them both, although the emulation of the buzz saw guitar sound can give you this idea. Their work is good, but must evolve a lot as well. The album was mixed and mastered at Sunlight Studio by Tomas Skogsberg (the same one who worked on the albums I named above), so it’s not an unexpected fact that the band wanted to have a sound quality that could fit on Swedish Death Metal School from old days. But as well they don’t deny the modern clarity, to have a comprehensible sound for the fans. “Refuse to Rot” is a good album, indeed, having good moments on songs as “Wither Ways” (very good vocals, that are a bit different from what we can expect from guttural screams), the harsh feeling that permeates “Pulverize” and “Tales from the Tomb” (the slower tempos from this one shows the strength of the guitar riffs), the good melodies that arises from “Feast on the Flesh” (maybe one differential from them in terms of Old School Death Metal), the bitter and oppressive slow parts of “Rest in Pieces” (a very good work from bass guitar and drums can be heard on this song), and the raw energy inception that comes from “Enter the Crypt” (once more, very good distorted and harsh melodies arises from the guitars). This last one is a song that really shows that they have a lot of musical potential to offer, so they need to spell it out from their souls. 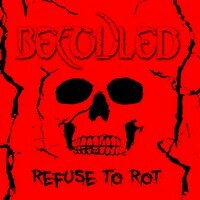 A good album for now, but we can expect great things from BEFOULED in the future.